Another day and another heinous terrorist attack on people attending a concern in Manchester, England. Over twenty were killed and many more wounded in the attack which also left the terrorist dead. Among the victims were young children, innocent by any standard. Terrorists of all kinds share a common hatred for human beings who are not like them, people for whom they blame their condition on. It has been so since people discovered that terror, committed in the name of a religion or ideology either by state or non-state actors works. Monday’s attack by a twenty-two year old Salman Abedi who according to neighbors dressed “in traditional Islamic dress.” The Islamic State claimed responsibility for the attack but at present little is known about Abedi other that he was born and raised in Britain and might be of Lydian descent. His actual connections to ISIS are unknown. It appears that he deployed an Improvised Explosive Device that was loaded with explosives as well as nails, metal scraps, and screws which made it a perfect anti-personnel weapon which he set off at a time guaranteed to cause maximum casualties. His act, as are all terrorist attacks aimed at innocent non-combatants can only be described as evil. The fact that it appears to be done in the name of his Islamic God does make it any less so. It was an act of evil. But the problem is that his act will inspire other Islamists to conduct similar attacks and provide grist to those who want to blame all Muslims for the attack, provoking violence against innocent Muslims who detest and oppose the kind of attack made by Abedi. Th Islamic State claim of responsibility included the statement that the attack “was in revenge for Allah’s religion, in an endeavor to terrorize the [infidels], and in response to their transgressions against the lands of the Muslims.” In the United States fundamentalist Christian extremist Theodore Shoebat said “he feels no sympathy for these people. The people who died, the people who were injured… I really don’t care. 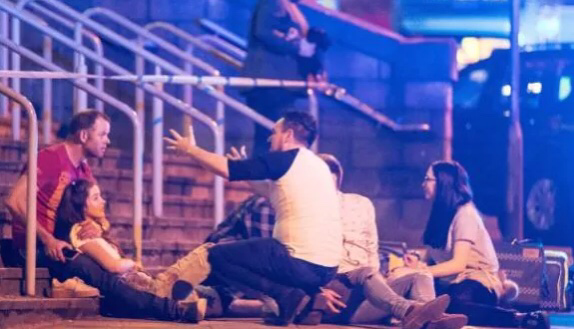 The types of people who go to these concerts are the same people responsible for the degeneracy that you see in society…” In other words the murder of children is just as fine to self-proclaimed Christian Shoebat as it is to ISIS. Both would have fit in well with the Nazi troops who killed Jews by the millions and killed innocent children up close and personal. They are all evil and they all think that they are the righteous. However, it doesn’t have to be this way as historian Laurence Rees notes, we do not need to succumb to the bloodlust of revenge and retaliation. We can seek justice without victimizing other innocent people. We do not have to give in to what Hannah Arendt referred to as the banality of evil.” We have the choice as individuals as how to behave towards our fellow human beings. Rees noted: “…human behavior is fragile and unpredictable and often at the mercy of the situation. Every individual still, of course, has a choice as to how to behave, it’s just that for many people the situation is the key determinate in that choice.” The fact is that we cannot allow the situation to determine what is right and wrong in how we respond to terror and in doing so condemn the innocent along with the guilty. Anyone knows me knows that all terrorism is evil regardless of its motivation. Over the years I have spoken out against all types of terrorism and that I have no sympathy or desire no mercy be shown to those who commit or sponsor it, but at the same time I do not believe that we should allow fear and hatred to cause us to seek retribution or revenge upon innocent people simply because they share a common racial, religious, or national origin of the guilty. To do so makes us no different than those who kill children at a concert simply because they live in a country opposed to ISIS, or because they or their ancestors belong to a country, religion, or race that we despise or believe are less than human. Hi Steve – not sure if you follow Vicki on Facebook, but if you do, find her commments on the atrocity in Manchester, which she posted this morning – very thoughtful and thought provoking.